Andalusia is an incomparable place to visit and enjoy its history, gastronomy, natural landscapes, charming villages and its wonderful coastline. No matter which province of Andalusia you visit, each and every one of them has something special. The Andalusian Coast covers 1,100 kilometers of coastline, between the Mediterranean Sea and the Atlantic ocean, where some of the best beaches in Spain are located. 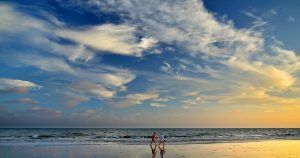 If you are planning your summer vacation, in this post we selected 5 of the most beautiful Andalucia coastal towns to enjoy this summer. The Andalusian Coast, a real paradise to spend your holidays. Choose one of these 5 Andalucia Coastal towns to rest and enjoy this summer. 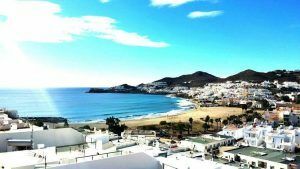 We will start talking about Níjar (Almería), one of the most beautiful beach towns in Andalucia (from Sierra Alhamilla to Cabo de Gata). The town is part of an urban complex of great attractiveness, although the most important part of the area is Cabo de Gata Natural Park, which hides unique landscapes, volcanic mountains, a coastal part of Spain with wonderful beaches and great anthropological value. 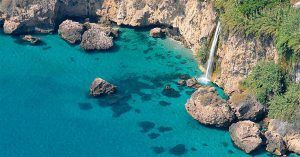 Among all its beaches, the following stand out: Agua Amarga Beach, Ancón Beach in Cabo de Gata, Cala Arena Beach, Genoveses Beach and Cala Barronal Beach. All of them have fine golden sand and with crystal clear waters. It can be said that Almuñécar is the capital of the Costa Tropical, this is how the coastline of Granada is called. Almuñécar is one of the villages in Andalucia with beach and charm, thanks to its tropical crops, its white houses, Cerro Gordo viewpoint and the pine trees, which turn this coastal area into a place of contrasts. The most outstanding beaches of Almuñécar are: San Cristóbal beach, La Herradura beach, Puerta del Mar beach and Velilla beach. Some are small coves with calm waters and other larger beaches where you can find all kinds of tourist services. Nerja has become one of the most important seaside towns in Andalucia thanks to its numerous elements of interest, such as the caves of Nerja, the balcony of Europe, the cliffs of Maro, but, above all, because of its beaches. In Nerja you can discover paradisiacal beaches of crystal clear water surrounded by wild nature, where you can enjoy from a calm atmosphere. Some beaches, such as Cala Barranco de Maro or La Caleta de Maro, are difficult to access, since you need to walk a path of about 10-20 minutes, making this beach more empty than the rest of the beaches. 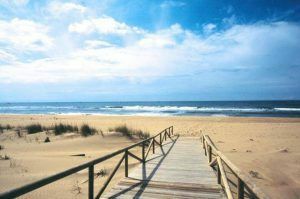 Conil de la Frontera is located in the southwest part of the province of Cádiz, a coastal area of great fishing tradition and natural beauty that offers incredible places of interest, such as its pine forests, its cliffs and above all, its white sandy beaches. Conil de la Frontera stands out as one of the most beautiful villages in Andalucia, thanks to the numerous pristine white sand beaches and cliffs, such as Castilnovo beach, Bateles beach and Fontanilla beach. El Rompido is located in the natural area of La Flecha, one of the most important land in Spain due to its morphological characteristics, the beach of Nueva Umbria, a “tongue” of fine golden sand, located between the Atlantic Ocean and Las piedras River. An ideal place for lovers of quiet nature. In addition, it has numerous routes for hiking or biking among in the dunes and pine forests along Doñana, Isla Cristina and the marshes of Odiel river.